Fletcher Roberts is determined to cement his spot in the Bulldogs’ 22.
westernbulldogs.com.au catches up with the players in the off-season. 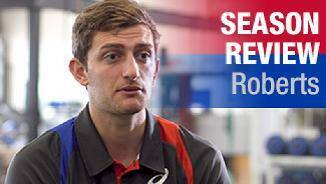 westernbulldogs.com.au reviews Fletcher Roberts' 2017 season. Roberts: "We were a little bit up and down"
Picked up in the 2011 AFL Pre-Season Draft, Fletcher Roberts is a versatile tall who after being drafted as a forward but has developed as a reliable key defender. After playing 12-games in season 2015, including the Elimination Final, Roberts backed up to play 18-games in season 2016. Roberts was an important member of the Bulldogs' defensive unit that helped end the Club's 61-year premiership drought, finishing the season as a premiership player. Fletcher Roberts put together a strong season at VFL level, culminating when he finished runner-up in Footscray’s Best and Fairest. Roberts played two AFL games (GWS and Port Adelaide) this season. Used as a dual position player in the VFL, Roberts spent time between the forward line and back line. He played 18 games for Footscray, averaging 13 disposals and four marks. 24-year-old Fletcher Roberts played a total of 10 games in 2017. Roberts made the senior team for 8 consecutive weeks between Rounds 1 – 8, but fell out of favour thereafter, playing again in Round 12 and Round 16. In June, Roberts agreed to terms on a two-year contract extension, keeping him at the Club until at least the end of the 2019 season. Ranked 1st for effective disposals % per game in the competition. 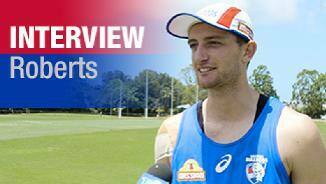 “Being able to sign on for another two years is obviously a really great thing for me. I’m really happy to be at the Bulldogs. I think that’s going to be a real strength of our club over the next few years. Our ability to sign on plenty of guys and really be committed to what we’re building here. Fletcher Roberts didn’t make an appearance at senior level until round 6 against North Melbourne due to an injury interrupted preseason, but would play 18 of the next 21 games, including a standout performance down back on Preliminary Final day. The 196cm, 90kg Roberts has the size and athleticism to go with the AFL’s monster forwards, and can’t be faulted for effort - the 23-year-old ranked 20th in the League for one-percenters per game. In fact, since round 16 against Richmond, Roberts led the side in seven of the ten games he played, finishing second or third in the remaining three. His most consistent season yet and will only improve with another preseason under his belt. Roberts’ 18 games was a career high. “I had a bit of a slow preseason with operations last year but I tried to stay positive off the back of that and just focus on playing as many games as I could and try and find that consistent form that I’ve been striving for for a couple of years. “I think a full preseason is really going to help me pursue the improvement areas that I really want to work on. The defender took a significant step in his football career, playing 12 games – the most of any year since his debut in 2012. Roberts earned his first call up to the senior side in round five and played 10 games on the trot. He took on a key defensive post and was matched against some of the league’s best forwards, forming a nice partnership with Joel Hamling in the back half. Such was Roberts promise in 2015, he signed a two-year deal in July, keeping him with the Club until the end of 2017. The defender unfortunately suffered an ankle injury in round 15 to spend four weeks on the sidelines before returning through the VFL and eventually making his way back into the side in round 23. Roberts’ confidence was evident as he strung together consistent football, and looks set to be a key pillar in the Dogs’ defence for years to come. 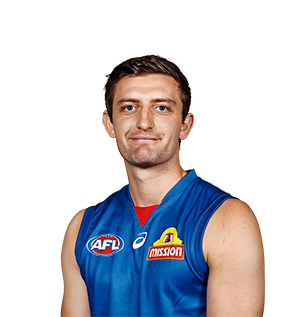 Roberts ranked third in the AFL for effective disposals per game, finishing the year at 87 per cent disposal efficiency. Although Roberts struggled to get his chance at senior level, he strung together five games for season 2015. With strong performances at VFL level, he missed playing in Footscray’s VFL Premiership side through injury, but was instrumental to their finals campaign setting up a home qualifying final with his goal after the siren to claim the win over Richmond and second place on the VFL ladder. Roberts took an impressive pack mark after a kick in from opposition Richmond to be given a chance after the siren to put the Bulldogs in front. 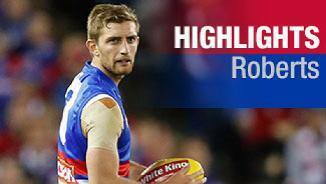 Roberts slotted the goal from 60m to give the Dogs a three-point win. Although improving his defensive game and spending more time down back in 2014, his impressive match-winning goal showed he has the potential to be a full-time swingman in years to come. Proving he can handle high-pressure matches, Roberts will be looking for a big pre-season to further his chances of cementing a spot in the senior side in 2015. Roberts match-winning goal in the VFL helped secure second spot for the Bulldogs and a home final at Whitten Oval. “I’m just enjoying my footy and enjoying the challenge of taking on an opponent and trying to beat them. After debuting in 2012 with two games, Roberts spent 2013 with VFL affiliate Williamstown in a season of development. The Sandringham Dragons tall played 16 matches for the Seagulls, was named among the side’s best three times and kicked 11 goals playing in a variety of roles. Another summer in the gym should see Roberts placed in good stead for more opportunities in 2014. Despite playing much of the season as a swingman, the 20-year-old still managed to hit the scoreboard frequently. Kicking 10 goals from four games in the VFL development league, Roberts still managed 11 goals in 12 games in Williamstown’s senior side – including four multiple goal games. “Roberts played back for most of the day and was very, very solid as a defender. Read the flight of the ball well and took a lot of intercept marks. Then went forward and had an impact as well in the last quarter. Getting a late call up to debut in round 20 against Richmond, he put in a solid performance as a substitute and showed enough to retain his spot and play out a full four quarters the week after. Roberts was shifted forward in Williamstown’s finals campaign, successfully adding a taller target in the Seagulls forward line for the final three rounds. An exciting 196cm forward who kicked five goals, including four in the last quarter, for Sandringham Dragons in the TAC Cup Grand Final last year. He reads the play very well, has good skills and will be working hard to add bulk to his light frame in 2012.